Essays and articles on sobriety and recovery for women, utilizing the program from Women for Sobriety. Don't Panic When Things Go Right! As I've mentioned before, I have a painful physical condition that severely limits my ability to do the most ordinary things. I had surgery in June, but it didn't "take" and I entered December nearly as bad off as I was before. I receive my medical care from the VA, and while they do amazing work once they get organized, getting organized can take an extraordinary amount of time. Long story short, I finally saw the neurosurgeon again and he told me I had re-herniated the disk the operation had supposedly fixed, and now there was some concern about the disk below. This is why I keep falling over for no apparent reason and am occasionally having surges of pain that literally leave me on the floor. His recommendation? A second surgery. I have said that if it meant I could walk to the back of the grocery store unassisted they could saw me in half, but facing a second operation on my spine in six months left me a little dazed. On top of that, with it being a holiday season, I assumed approvals through fee-basis (the section of the VA that handles paying for care outside the VA itself) would take even longer than usual. Instead, I had a call yesterday that I was "cleared for takeoff" and should be scheduled for surgery by the middle of January. Oh, happy day! Things went perfectly this time around, no foot-dragging or second opinions or other red-tape. I could not be happier! But ... nothing is ever this easy. Something will go wrong. There's a shoe out there to ready hit me in the head and ruin everything. What will I do then? Do any of those thoughts sound familiar? They are very common in early recovery, as women start to feel stronger--only to have old negative ways of thinking start jumping up and down in front of them. In other words, they panic because they can't believe they are actually doing what is needed to become sober. Many of us come to the moment of choosing life over alcohol having tried and failed before. We dredge up old memories of thinking things were going right, only to be shot down for some reason or another. We are so conditioned to look for the negative that seeing an open road before us is terrifying; our minds start creating all sorts of "what-if"s that must be hiding in the bushes waiting for us to take the next step forward. Negative thoughts destroy only myself. I'm not suggesting that recovery is free of pitfalls and challenges. There will be many along the way. What is important is that we don't create even more by assuming the worst instead of embracing the best. Each step we take away from a life controlled by alcohol makes us stronger; it is up to us to recognize that we are indeed living a New Life and that what has happened in the past is not a wrecking ball certain to cause us to fail in the future. One of the issues we face in early sobriety is known as "awfulizing", where we convince ourselves that a future without alcohol will be much worse than what we are accustomed to. Removing those negative thoughts is vital in assuring our success. As my grandmother used to say: "Don't be so convinced the fox will get the hens that you don't bother to close the gate." Don't let "what-if"s wreak havoc because you can't believe they won't. In other words, don't panic when things go right! Learn to live in the now, to accept and relish success in this moment instead of looking to the future or past. The past is gone forever, and without alcohol in our lives, we are no longer those women. We have changed, and so what happened then can't be a guideline for what happens now. You have certainly heard commercials for investments that say "past performance is not a guarantee of future profit." Indeed, no matter how much a situation appears to parallel something in the past, important variables have changed. Our judgment is no longer clouded by alcohol, we have seen what doesn't work, and we are actively seeking a better life. Looking to the future can also be dangerous. If we assume a future failure, there is little reason to enjoy the present. Instead of believing that good things in the present can translate into good things in the future, we dismiss what has gone right and start looking for what will destroy our forward motion. Recovery is very much based in the now. We are sober this breath, this moment, this hour. What has happened before is gone and what might happen in the future cannot be predicted. Instead of panic, we should embrace our success--no matter how small--and see that success as building our inner strength. The stronger we become in the now, the further away the past becomes. The stronger we become in the now, the more likely we are to be successful in the future as well. If you find yourself looking for negative outcomes to present success, try this: Close your eyes and imagine yourself overcoming any obstacle that might come your way. Focus on the inner satisfaction and pride that being successful brings. Now look at what steps you took in your imagination to reach that goal. Even if they seem silly or impossible, they represent your ability to choose how to face difficulty. If you can imagine being successful, you can be successful. This exercise can be difficult at first; breaking through negativity is not always an easy process. If you find yourself struggling with thoughts such as, "I can't do this" or "Nothing I do will change my future", take a deep breath and kick that thought to the road. That's right. You can be the shoe, only what you destroy isn't your success, it's negativity. Turn the tables and be the one in control of your thoughts and actions! It is reality that things won't always go your way, regardless of how much visualizing or planning you do. There will be times when the only thing you can control is your own reaction. In my case, I can't magically make the pain go away. I can't cure myself by simply visualizing being cured. What I can do, and what is important, is that instead of panicking because things are going well I can embrace the forward motion. What happens after today is out of my control, but for today I can recognize that right now, right at this moment, things are going well. I am what I think; I can choose whether to be a victim or a warrior. I choose to be a warrior. I choose to face the future knowing that no matter what happens, I don't ever have to give up. Ever. Think about that concept today. In your recovery, are you a victim or a warrior? It's up to you whether to assume you will fail, or to gird yourself with the knowledge that things do go right and face the future strong and determined. Life can be ordinary, or life can be great. Don't panic when things go right--recovery is an ongoing process and the only true failure is surrender. Facing an uncertain future that likely will be about managing how much pain I’m in instead of getting rid of it altogether, I collapsed. I couldn’t imagine living this way for another forty years. Anyone who knows me would have been shocked to see me sobbing into a pillow, but I couldn’t keep up the smiling any longer. Why, you ask, am I rambling on about myself? It’s simple; I was comparing my life before with the life ahead of me and being frightened and depressed, just like so many of us feel when we seek to get sober. Looking behind us, we see someone who could handle stress, who could cushion her anxiety and sadness with alcohol. Looking forward at a life without that support leaves many terrified and not sure it’s “worth the risk” of facing the future squarely and sober. We want our old lives back, even though we were killing ourselves slowly. Many of us also played the role of Superwoman; we couldn’t say no, couldn’t cry, couldn’t show any sign of being imperfect. Unable to ask for the help we needed, we held it all inside and turned to alcohol as a solution. I am very guilty of this perfectionism even with seven years of sobriety under my belt. I no longer drink to maintain a sense of control, but I still have a huge problem with asking for help when I need it. Statement One can apply to a physical disorder, such as mine, as well as addiction. We must put aside the past and take charge of our lives in the now, whether that be not drinking or not holding in our emotions until we collapse. It is when we take that responsibility that our disorder becomes something that “once had” us. We are no longer just responding to life, we are seeking to create the life we want. Statements Two and Nine go hand-in-hand to provide a blueprint for taking charge of our reality. The past is gone forever. I can’t go back and neither can you. We cannot change what has already happened, but we are creating our New Life with every decision we make. We victimize ourselves by brooding about things we can’t change; we keep the tape of negative thinking rolling loudly in our minds. Those thoughts are like kudzu, growing and strangling attempts to move forward. We must remove that negativity in order to embrace our New Life. If you are new to sobriety, I would like you to close your eyes and imagine this: all your negativity and brooding are rolled into a vicious, many tentacled beast that has followed you around for as long as you can remember. Every time you’ve tried to break free, a tendril reached out and pulled you back. Now imagine that beast locked behind a gate; in embracing sobriety you create that barrier. Negativity reaches out through the bars trying to drag you back; the beast whispers that unlocking the gate will solve your problems. You have a choice; listen to the words that you know in your heart aren’t true, or turn around and walk away. That is your first conscious sober act—you simply walk away. Each negative thought is a tendril reaching out to stop you, but they are not all the same length, and with every step, you break away from one. With every tendril you shake off, it becomes easier to continue forward. You are a new person and will no longer allow negativity to victimize you. It is important to realize that you are not walking alone. The tendril that tells you asking for help makes you weak is one of the longest negative thoughts we face. Asking for help shows strength. It shows you are willing to admit you don’t know everything and are open to the wisdom of others who have walked the same path. Yesterday, I had to make that choice. I could continue adding the pain of reminding myself what I could no longer do on top of the physical pain I was in, or admit my imperfection and reach out for help. I posted on Facebook; the hugs I got lifted my mood. I tend to feel alone because I have difficulty making friends, and seeing that others do care allowed me to stop thinking I had to suffer silently. I told my partner instead of trying to hide it from her. She couldn’t support me if she didn’t know how I felt. Statement Ten: All love given returns. I will learn to know that others love me. We don’t have to be isolated. We aren’t the only one feeling this or worried about that. Misery really hates company when that company is uplifting. The WFS message board and chat room are there to help you, to break the feeling of isolation and offer hope and support when you feel you can’t go on alone. Make use of these tools without fear of looking weak. Every one of us has felt that helplessness at one point, even those with years of sobriety. To sum up this meandering musing, I offer Statement Eight: The fundamental object of life is emotional and spiritual growth. Daily I put my life into a proper order, knowing which are the priorities. Negative thoughts, especially in early sobriety, keep us from that growth, from understanding of what our priorities are. Asking for help when we are struggling should be one such priority. Inner growth does not happen independently; it comes from seeking to replace our negative beliefs with empowering ones. Don’t wait to seek support until you’ve collapsed. Reach out and open yourself to the caring and wisdom of others. The past cannot be changed, but the future is a blank book. Fill that book with happiness, remembering that you are in charge of your mind, your thoughts, and your life. Asking for help doesn’t show weakness, it shows growth, so don’t be afraid to use it as an important tool in your journey through recovery. I want to start out by drawing a clear distinction between what experts define as a "slip" and intentionally breaking sobriety. A slip is not pre-planned. It comes as a response to a specific trigger. Giving oneself permission to drink ("I’ll write it off as a slip") beforehand is NOT a slip; such thoughts generally indicate that a relapse is already occurring. It is not an excuse and not a justification. The holidays are in full swing now, and many of us are feeling a little insecure about our sobriety. For those with only a few days or weeks, this is a time that presents an enormous challenge. The season is already stressful for most people; parties and family and gift-giving all act to raise our internal tension, and in the past we have relied on alcohol to cope. Facing a sober December can pile even more stress on our backs, leaving us grasping for some way to handle the pressure without drinking. Updating our sobriety plan, making sure we have plenty of phone numbers and email addresses of sober sisters, and making certain to follow Jean's advice (rising 15 minutes early for meditation on the statements) are great ways to help give us breathing room when the festivities become a battle to remain alcohol-free. There are also more immediate resources online (chats and the WFS message board) if we find our determination wavering. It isn't something we like to think about, but many in recovery relapse during December. Stress becomes too painful to bear and our commitment wavers for just a moment. We fall back on our old coping mechanism and have "just one glass." After that one glass we are faced with a choice: to continue drinking, to fall back into old habits and old coping patterns, or to step back, reaffirm our dedication to our New Life, and move forward on the path away from alcohol. It is very common for those in recovery to view that one drink as destroying everything they have built. "I threw away X days, so I might as well keep drinking." This is rigid thinking, assuming everything is black and white with no between. We drank once, so we will certainly slide back into oblivion. There is no hope for us; we continually repeat these sorts of thoughts until they become a self-fulfilling prophecy. We fall into the water and instead of pulling ourselves out we convince ourselves that the only choice is to drown. "Negative thoughts destroy only myself." Statement Two reminds us that we are in control of our thoughts. Imagine that each insult we hurl at ourselves, each demeaning comment, is a rock put in our pocket. Every stone we weigh ourselves down with makes it harder to change our mind and get back to shore. We are not passively drowning—we are committing suicide. 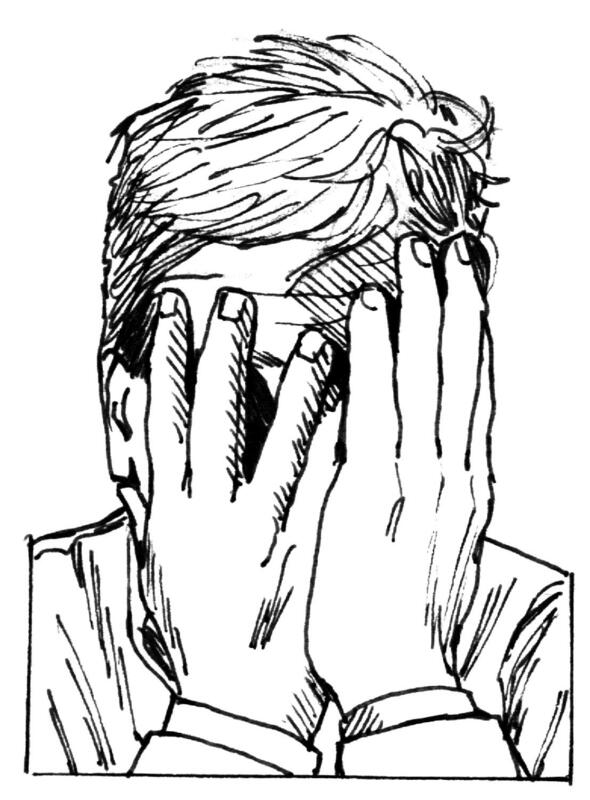 There are three general internal responses to a slip (the experts define this as a single incident of unplanned drinking); blaming oneself for being "weak", blaming external forces "beyond my control", and recognizing that the lapse was due to being unable to cope effectively with a specific high-risk situation. Which do you think is least likely to lead to a full relapse? It is the third group — those who view their slip as a learning experience and seek to develop new coping mechanisms. As Statement One says, "I have a life-threatening problem that once had me. I now take charge of my life and my disease. I accept the responsibility." That doesn't mean blaming ourselves or anyone else for a lapse. It means recognizing the trigger and creating a new way of coping with it. Statement Four also speaks about being responsible for ourselves. "Problems bother me only to the degree I permit them to. I now better understand my problems and do not permit problems to overwhelm me." The words in bold speak to me as helpful in responding to a slip. We are responsible for ourselves; we constantly strive to understand high-stress situations and to develop positive ways to cope instead of wallowing in misery. We look forward instead of back. We see a chance for improvement, not an excuse for relapse. The past is gone forever, and so are our old methods of responding to stress. A slip does not have to become a slide into icy water. Which present will you give to yourself this holiday season; strength or surrender? The choice is yours. I've been heading to a bad place lately, a really bad place. It seems like everything is going wrong and every solution is a failure. I find myself thinking, one more straw and I'm done for. And in the middle of this meltdown sneaks the idea of drowning it all, just for a while. Sound familiar? We've all been there. The negativities keep piling up until the only chatter in our head is about how horrible and hopeless our situation is. We are teetering on the edge, and the idea of falling back on our old solutions starts to glimmer like a last hope. The non-stop mental chatter which arises when we start to feel stressed and stuck has been called the monkey mind. Our thoughts bounce from one negative to another, growing more frenetic and confusing until we feel exhausted just trying to keep up. We'll do anything for a moments peace. Although alcohol may seem to offer that distraction, it is important to realize the reality that drinking creates. When we try to drown the running dialog in our head, we don't end up with peace and quiet; we end up with a mind full of drunken monkeys. So what do we do when it feels like the walls are closing in? It can help to change how we look at the thoughts running through our head. 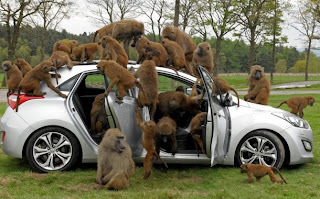 Instead of picturing monkeys running amok, imagine your thoughts as unruly children in a carpool. If you have ever participated in the particular joy that is sharing the transportation of children, you know what it's like to have a car full of bouncing, jabbering kids. If not, tune into any show on Disney for ten minutes, and you'll get the idea. How does this shift in our perception help? When we are at our wits end, all of our thoughts seem to jumble together in one big pile. We don't know where to start untangling the mish-mash and not knowing only adds to the frustration. By visualizing those same thoughts as individuals, we give ourselves the opening to gain control. Which of your issues is the loudest, most obnoxious child in the carpool? That's the one to drop off first; do what you can to solve the problem and then let it go for a while. Turn to the second most irritating, and the third, and so on until your car is peacefully silent. You may not have solved all the problems facing you, but you likely have taken care of a few of them. Giving yourself a respite from the noise allows you to breathe, regroup, and reenergize. Most importantly, you have remained sober. Negative thoughts destroy only myself. Don't let the drunken monkeys back into your life; the carpool lane may be noisy, but with sobriety there is no doubt you are in control. Are You Afraid of the 1%? On my way to work this morning, the discussion on the radio was about texting and driving, and how organizations are asking people to pledge that they won't. One of the hosts stated that he couldn't sign the pledge because, while he was 99% sure he could do it, he wouldn't agree to something he wasn't completely certain of. The parallels between the danger posed by texting and drinking while driving had already been obvious to me, and this statement really stopped me in my tracks. I had to wonder if this individual would feel the same way about a non-drinking and driving pledge. He was obviously afraid of that tiny chance he might fail at his texting pledge, and so was refusing to make the commitment to try. One thing I often hear from women who are struggling with the question of whether or not to stop drinking is that they are afraid to state they will stop, because there is a chance they might fail. This fear of failure prevents them from trying, even if the odds of success are 99%. They are afraid of the 1% that remains. Fear is a constant companion when we are actively drinking: Fear that others will discover our addiction, fear that we wont be able to drink when and how much we want, and often a fear of losing our reliable friend and comforter. This fear keeps us trapped in the cycle of addiction. It is no surprise, then, that fear is at the forefront when we think about quitting. One thing about fear is that it tends to magnify what we are afraid of. If we are afraid of spiders, we will notice every tiny arachnid within eyesight. In one way, fear serves a purpose, to keep us safe from real threats. It's when our fear is misplaced that it becomes a problem. It can keep us from changes that will actually improve our lives. It is this kind of fear that keeps us from risking failure in any attempt to become sober, and can undermine our early recovery. So how do we overcome this fear? Seeing others who are successful in their recovery can help bolster our own willingness to try. Looking honestly at our drinking allows us to confront our fear and see how that fear of failure actually increases our chances of losing it all. We may be so afraid of sobriety that we destroy our families, our relationships, and even our own survival. Drinking can kill. Are you afraid of the 1%? Spend time today exploring your fear; does it protect you from harm, or does it keep you in harms way? Determine within yourself that you will not allow your fear to rule you. Focus on the positives of sobriety instead of the negatives that may or may not ever happen. Statement two of the Women for Sobriety program speaks clearly to this: Negative thoughts destroy only myself. Statement two also provides us with an affirmation that we can use to overcome our fear: My first conscious sober act must be to remove negativity from my life. This is key. Once we commit ourselves to recovery, we can only fail if we give up. The act of choosing sobriety allows us to focus on the 99% , the happiness we find in controlling our own destiny. Don't fear the 1%. Embrace the joy that opens when we no longer allow fear to rule us. Sobriety unlocks that door, all we have to do is walk through it. Moving the Mountain is Kindled! If you find this blog to be helpful or inspiring, please consider donating a dollar or two to the author. Thank you. My books are available at Amazon.com and other online booksellers! Update: Both titles are now available for Kindle, NOOK, and in iBooks! Copyright 2010-2012 by M. Broughton Boone, all rights reserved. Picture Window theme. Powered by Blogger.